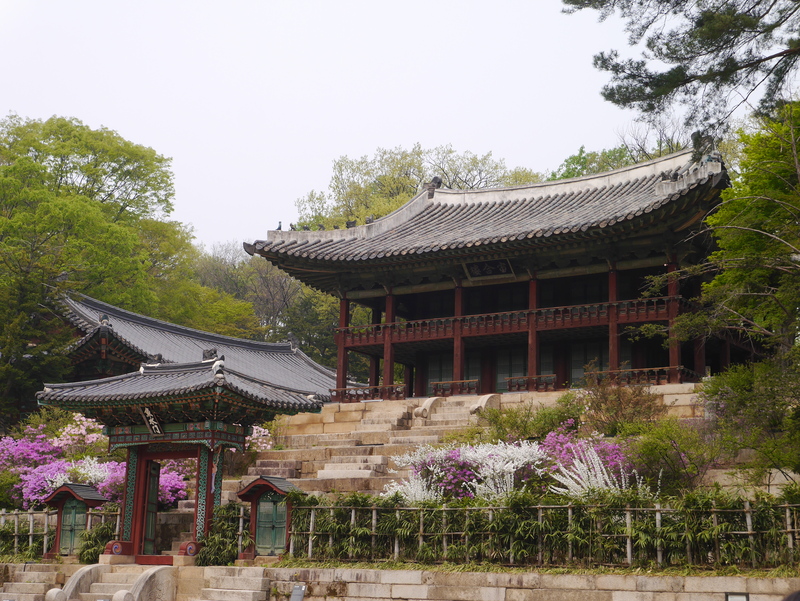 Tuesday and Wednesday were filled with adventures including a tour of a palace, a visit to Seoul Tower, and shopping. 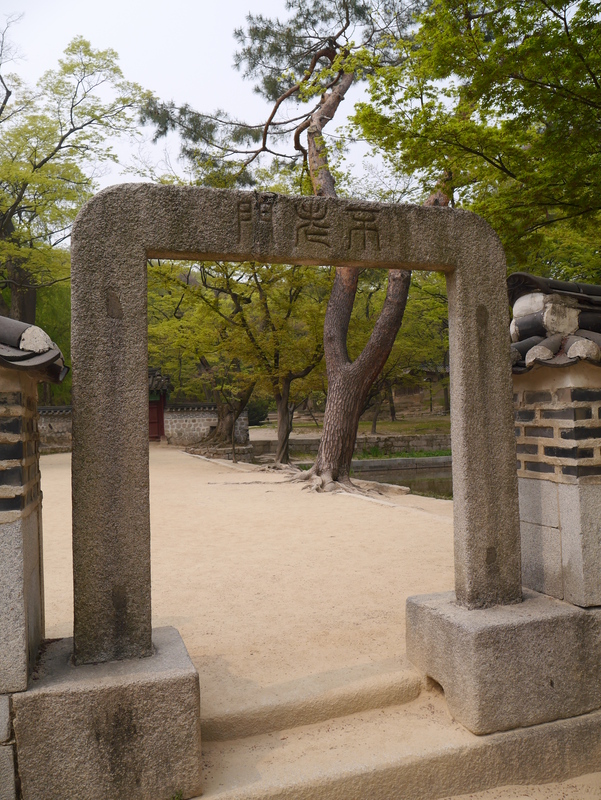 First thing in the morning we headed to the Changdeokgung palace. We were in time to get tickets to a special tour called the Secret Garden tour. The tour didn’t start for another two hours so we walked around a shopping area nearby. 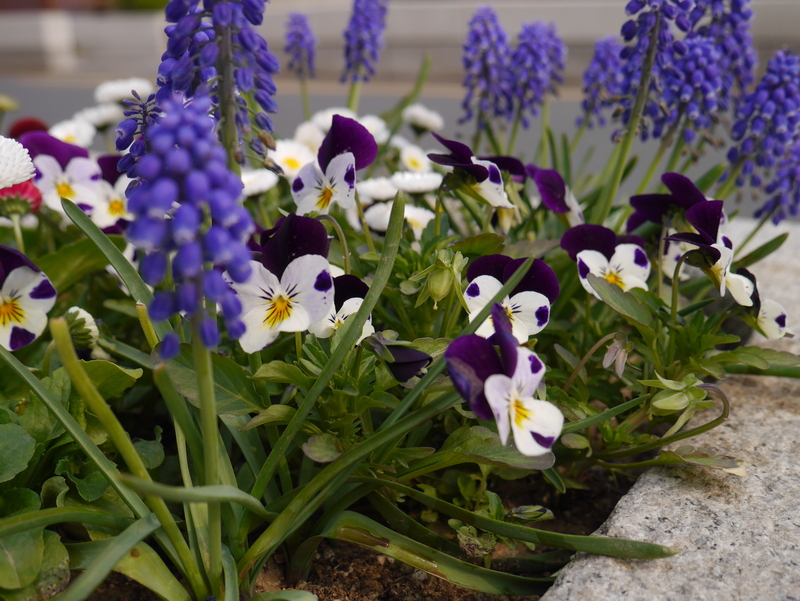 There were a lot of pretty sights, including the flowers to the left. There are so many stores in South Korea. I’m not sure why it amazed me, but it did. Gene and I learned that you can’t look too interested in an item or the sales person will start to harass you and expect you to buy something. That was super annoying because then I felt like I couldn’t actually look at anything too closely. I’m not a huge shopper to being with, so this just made it even harder for me. How did that characteristic come to be? Perhaps it was a good way of making money, practically forcing people to buy something. At least it helped me not spend so much money. I could always pretend I didn’t understand what the person was saying (and generally I didn’t), so I guess in the end it wasn’t too bad. I did end up buying a cute little ceramic pig that day, anyways. I’ve got a thing for pig figurines now for some reason so Sidney, Gene, and I thought I should keep it going. It was only $1 too, so how could I resist?! Fermented honey being pulled and stretched over and over. Before the tour we found a little stand where this interesting dessert was made. The dessert is made with fermented honey dusted in flour (I think) and wrapped around a chopped peanut mixture. The picture to the right shows the process towards the end. The white stringy stuff is the honey and the mixture on the left is the peanut filling. I wish I had taken a picture of the honey before it turned into that. 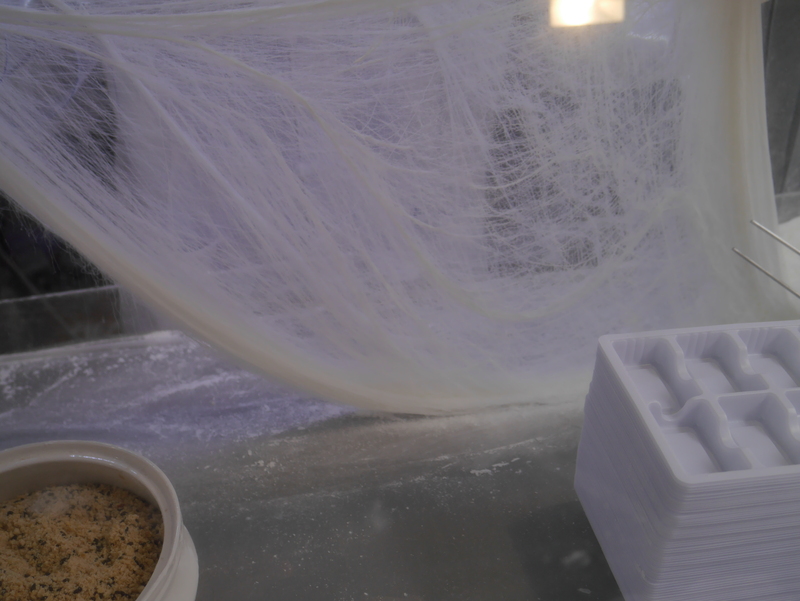 It was a chunk of honey that was rolled and pulled in flour. It was stretched over and over until it turned into what you see to the right. The dessert was quite tasty too! We headed back to the palace shortly after for our tour. It took us into the garden (which occupies 2/3 of the land) that the royal family, and those approved, used to relax and study. The garden was absolutely breathtaking. There were pavilions every so often that were used for things like writing poems and watching fishermen work and just enjoying the view. There was one pavilion where the crown prince studied. This one was not nicely decorated or colorful like the others because it was said he was supposed to show he was humble. I thought that was an interesting idea, even the crown prince needs to be humble at times. This garden was impressive because, as the tour guide said, it was mostly wild. The king had the gardeners leave most of the garden to itself, they didn’t tear anything up. So there were lots of trees and underbrush. It was like a forest inside palace gardens, it was so pleasant. 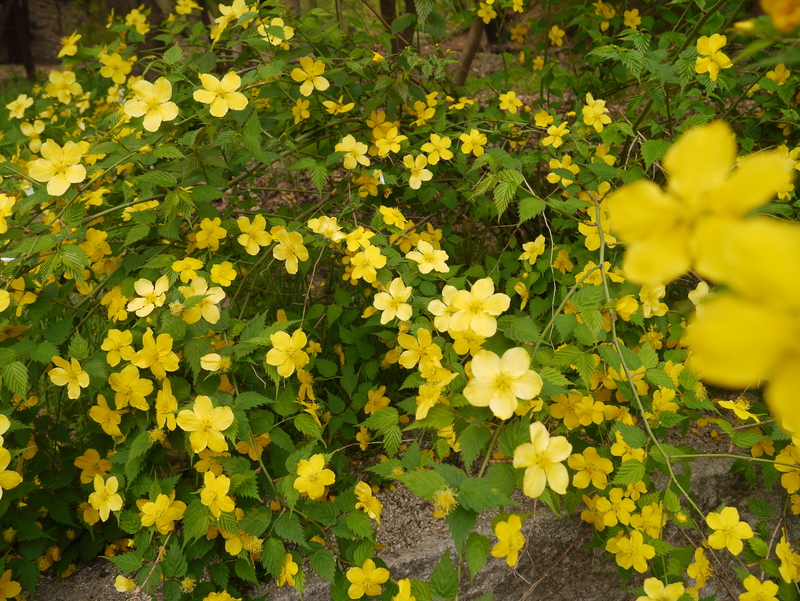 There were also flowers and flower bushes, most of which were in bloom. Yet again all the colors in this place were just fantastic. I had a great time taking pictures. In the summer, the ponds are full of lotus blossoms, which are supposed to be just beautiful. The tour guide explained that the aristocrats were supposed to be like lotus blossoms, because the flower can bloom in any type of water, even dirty. So the royalty is supposed to be perfect and elegant, even in times of strife. The tour ended sooner than I would have liked, but I’m glad we were able to stay as long as we did. I can just imagine what life would have been like, being able to walk in the gardens and listen to nature sing. After the tour we walked around the palace area for a bit. There were lots of buildings, some of them enormous. We saw the one that the king sat in for special ceremonies. The inside looked so old, I wonder when it was last used. We did some shopping, had Korean lunch, and went to Seoul Tower. Seoul Tower is a TV tower but also a tourist spot. It’s at the top of a steep hill and looks out over Seoul. 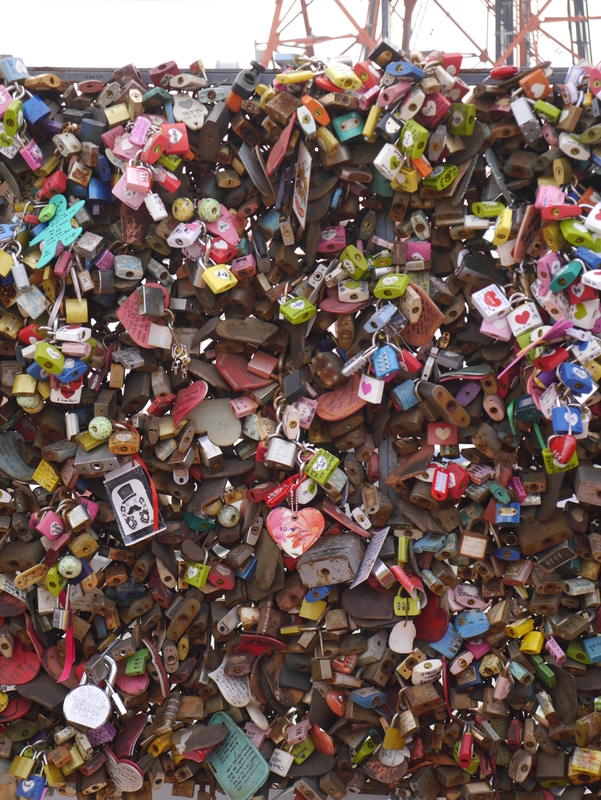 This is also the place where couples place locks on the fences. There are so. many. locks. I knew that there would be a lot but the amount there took me by surprise. I think it’s a sweet idea for couples to place locks on bridges and the like but now that it’s so popular it doesn’t mean much because the government has to keep cutting the locks off. We took a small rest at Seoul Tower where we saw a wild cat, trying to get food from a family. Then we headed back down and before going to Sidney’s apartment, we walked around Gangnam. Gangnam, the street and area made famous (at least in America) by Psy’s Gangnam Style song. This is the street where the most money is made in South Korea. I should have been better at people-watching on this street because supposedly many people in this area have gotten plastic surgery. Granted, I probably wouldn’t have been able to tell anyway so guess it doesn’t really matter. And who knows where that thought even came from. It’s probably not even accurate! On the walk back home we got some egg bread (an egg is cooked inside cornbread-like bread), which was tasty. We should definitely have that in the U.S.! 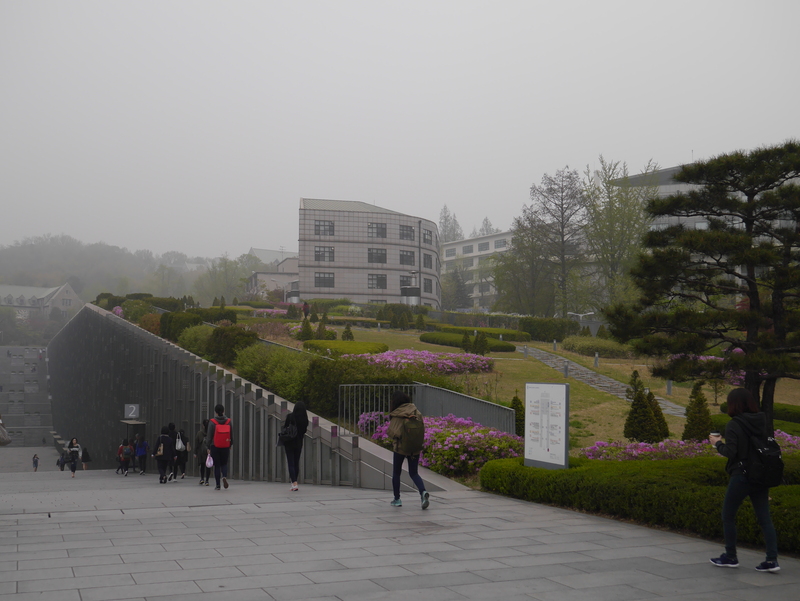 Wednesday morning we got to visit Ewha, the university that Sidney went to when she studied abroad! I had really wanted to see her school so I was so happy we got to go. Ewha is so freaking beautiful. At least the part that we saw. There is a building that seems to be built into the ground, the roof is grass and flowers and oh my goodness I loved it. We walked around a bit more in the university district before heading back home. Today was more relaxing because the next day we were going to do a lot of walking. Wednesday evening we took a bus to Dan’s apartment where we watched a movie, hung out, and got ready to go to the amusement park, Everland, the next day. Dan’s apartment is also a studio and his is very elegantly decorated. I can see his apartment being in design magazines. I wish I had taken pictures of both their apartments, but even if I had, it probably wouldn’t be wise of me to post pictures on here. So just take it from me that both of their apartments were awesome. Both of them had back splash tiles in their kitchens, which is something I want, so I really liked that part of their homes. Inspiration for when I have a house!